For purposes of divorce the pension interest in a pension fund, provident fund and/or preservation fund is defined as the benefits to which a member would have been entitled to in terms of the rules of such fund if his membership is terminated due to resignation, at the date of divorce. In layperson terms – it is the monies and interest accrued in the fund from the date of participation in the fund to the date of ‘deemed’ resignation and as such will not include the entire amount that the fund would pay out to the member at eventual retirement. The pension interest in a retirement annuity fund differs from that of the pension fund, provident fund and/or preservation fund in that the pension interest in a retirement annuity is defined as the sum of the member’s contributions to the fund up to the date of divorce plus a total amount of simple annual interest on those contributions up to that date at the prescribed rate. As such the value of a pension interest in a retirement annuity for purposes of divorce proceedings will be less than the actual fund value at the date of divorce. There is a common misconception that the pension interest for purposes of divorce is calculated from the date of marriage until the date of divorce, but as can be seen from above, this is not the case and parties should be wary of this when entering into marriage or contemplating divorce, and consider addressing this in their ante-nuptial agreement should the default position not be appropriate. • Married in community of property – spouse can share in the pension interest. 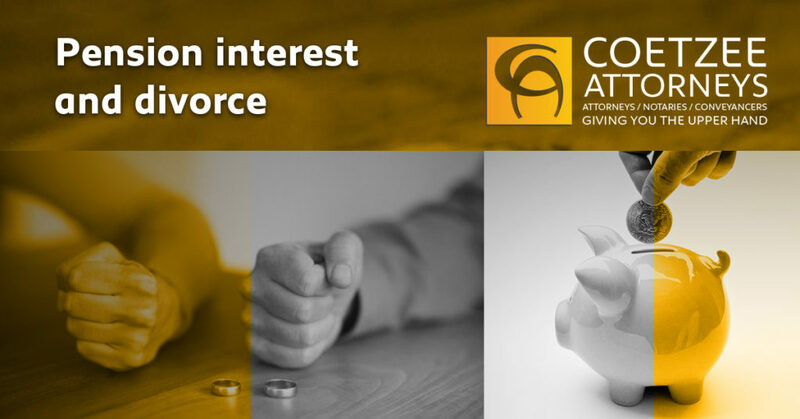 • Married out of community of property before 1984 – the pension interest may be included if a court considers that a redistribution of assets is warranted, with such pension interest taken into account for the redistribution of assets at the divorce. • Married out of community of property after 1984 and with the accrual – spouses can share in the pension interest to the extent that such is included in the calculation of accrual, and provided the pension interest was not specifically excluded in the ante-nuptial contract. • Married out of community of property after 1984 and without the accrual – the pension interest cannot be shared. In your situation, your spouse’s pension interest, calculated on the basis as indicated above, will form part of the calculation of accrual at divorce unless the pension interest has been excluded in your antenuptial agreement. It may be prudent to consult with a family law practitioner should the possibility of divorce become a reality.